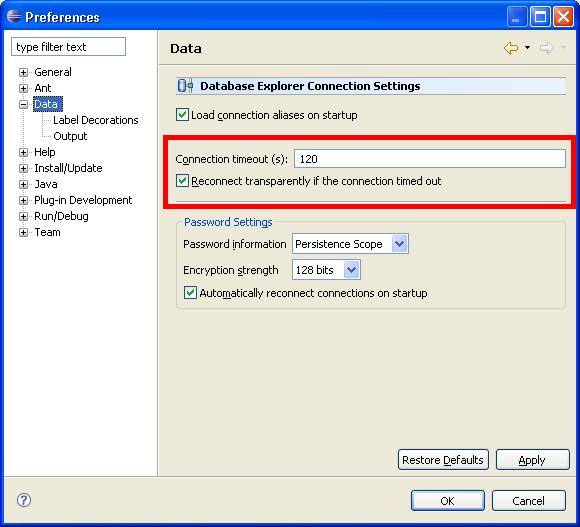 Difference between revisions of "DTP Connectivity Ganymede Project Plan: First Draft"
24) Refactor Generic JDBC Connection profile plug-ins so that the Generic JDBC Connection profile can be excluded from the new connection wizard by adopters. Just the visual appearance of the connection profile in the new connection wizard needs to be optional, the code in the plug-ins can remain. For Ganymede, we will focus on Must Have (MH) items before Like to Have (LTH) items. Perhaps look at it so that each individual server type implements an extension point (perhaps an extension on the CP extension point), listens in a server-specific way for disconnects, and then triggers a reconnect. It will be difficult to handle in the generic case.